This review is about 5 printed pages long. It is copyright © Matthew M. Gagnon and Jacket magazine 2008. You can read Lawrence Giffin’s review: Political Topology in Contemporary North American Poetry: Rod Smith’s «Deed» in this issue of Jacket. Rod Smith doesn’t have a classroom. He doesn’t have a lab in which to test the pleasures of poetry, to run a scalpel across the words “good house” to see what it’s made of. By all measure, Smith doesn’t need either of these environments mediated by the monies of the private sector; his terrain is carved from the discourses humming inside America’s body politic, where the public and private spheres of disclosure and dialogue appear an unstructured exchange of disparate interests. It is a real struggle to find shapeliness to the world, to offer its de-creation as post-foundational. Smith’s weapon of choice is the offhand counterpunch, the linguistic charades of orphanhood lisping their way through the generational tyranny of a faux democracy on the cusp of implosion. While Smith’s fourth book of poems may “refascinate” us to our variegated pouch of social injury, we are not alone in believing that to witness a politics run by a totality of market shares, is to distemper a suspicion to claims to ownership. The rogue tact of Deed attempts to repossess our cognitive processes onto the virtual playing field of a social contract where the spectacle is the precise image of decay. If our national theorem is rooted in the American deed as agreement, Smith is broadcasting his form of signage onto the dissonance of the real as the new century’s verbal guerilla warfare. The architecture of Deed is heterogeneous in its structure, utilizing the short lyric and serial poem to flout the reader’s sense of where the beginning begins, and the ending ends. This explicit complication of origins pivots around a syntax that challenges the performance of meaning on the page, as it indicates a refusal to provide a narrative that we can safely assimilate into our private brainpans. The preliminary repetition of “egret” and “house” articulates discordance in thought, creating a tonality of indeterminacy. This gesture allows the syntax to function as a meaning generator, relying less on individual words or phrases, and more on the clipped utterance parlaying the denotations of the repetitive words, and frequency of the stuttered saying. Both nouns can be read as mutually exclusive and entwined in a systematic relationship; initiates that oil the reader for a ride through the house as common residence and as a subterranean enclave of assembly. The productive forces inhabiting the house are as personal as they are impersonal, gendered as not. However, the “egret” of the prelude disappears until the final poem of the series, foregrounding its disappearance. Unwittingly, we are subject, bound to the competing ideologies framed from a variety of angles, each with their basis of logic. This is to say that “The Good House” finds its trajectory through the provisional, where self and other regard intimacy as a duration, equally “in history” as “de-housed” by a “periodic collapse” of stable relations and meaning. The latter passage invigorates these multiple tones by undermining our sense of continuity in favor of imperative statements and seemingly disembodied phrases aurally riotous in their descent onto a sliding scale of social value. Smith’s house is in a continual process of inventorying its contents, as if thinking and becoming weren’t parceled actions, but movements toward speaking the house as a site, where the personal and political share quarters and partake of their own sonic dialectic. Spiders have needs of webbing. The “webbing” of this passage also deals with notions of shelter, but immediately questions the network through which this shelter is achieved. If webbing is a network, an architecture of angles, inhabitations, and disclosures, Smith proceeds through negation, implying that the structure of the network is “loaded,” but unwieldy in its surfeit. Indeed, it is the surfeit of the marketplace gone global that threatens or redirects the idea of community. From the series of individually titled lyric poems “The Given,” “Poem,” stands out as a brief fix of ironic expressionism that exhibits a Frank O’Hara like spontaneity. Smith has “sacred // dumb guys // standing in the fake world // flipping out.” The straightforward language, as well as the opposition between “sacred” and “dumb,” provokes a ground where ideas of the deed as a social contract, are placed in the hands of an artificial construct. It’s just that the emphasis on reality falls onto the barons of politics and industry who for all intents and purposes, run the world with an iron fist. The would-be pathos of this poem is belied by the matter of fact ness that achieves a near perfect pitch despite the utterance clothed in brevity. In “Homage To Homage To Creeley,” an ode to Jack Spicer’s “Homage To Creeley,” Smith performs a valuable renegotiation of Spicer’s original form: a short lyric followed by a line running horizontally across the page followed by lines set as prose. Form as aesthetic effect is eschewed by Smith for a return to a formalism that engages with a dialectics that is demanded by Spicer’s formulation. This is less an anachronistic re-imagining than a politics of form, where the composition becomes a place in which the architecture supports forms of rhetorical questioning: “I don’t know if this is about the weather. / Weather is something that’s ‘outside.’ / I love you.” The transference from self-doubt to imagining an “outside” reading of events, also throws into question authorial intent and the possibility of a truly expressive lyric modality. It’s originally the desire for personal expression, held by poetic tradition, that inevitably comes to spar with the postmodern sensibility towards a poetics of openness, of participatory meaning. Smith’s employment of multiple aesthetic forms and rock solid acumen interrogates the polis on the hill and performs a feat where “mist is similar to certainty. alas / & discover, a calming / earlier / half-lit / committed quitter bottoms out on the mad grub.” His characteristic noun couplings are radioactive conglomerates injecting a “certain amount of light” onto our global fuse box set to combust. However, Smith’s erudition is never brought to the fore for the sake of showiness, nor is his radical intelligence or linguistic play pulling the wool over your eyes. The torque that language undergoes through Smith’s care has been compared to the stand-up comedian, Stephen Wright, whose brilliant arrest of anti-logic, can be characterized as a subversive gesture to withstand the “situation we’re now in as Americans.” Deed substantiates Smith’s role as a poet on the forefront of a community of poets writing out of a commitment to social critique. While Smith’s poems sometimes border on the hermetic, their grasp of modern and post-World War II American poetry chisels a place among a range of challenging contemporary writing. Matthew M. Gagnon grew up in northeastern Massachusetts and has since lived in Vermont, Colorado, and western Massachusetts. 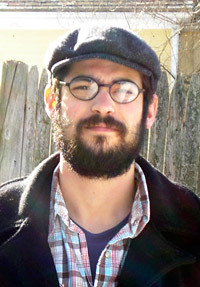 He is currently a student at the University of Massachusetts MFA Program for Poets & Writers in Amherst. His reviews can be found at Octopus Magazine and CutBank Reviews.